PT Petrokimia Gresik - PG or later known as Petrokimia Gresik is a reputable company in Indonesia, running business in integrated fertilizer industry. Based in Gresik East Java, PT Petrokimia Gresik is a holding member of state-owned fertilizer company PT Pupuk Indonesia Holding Company (Persero) or PIHC Group. At present, PT Petrokimia Gresik is 99.9975% owned by PIHC Group and 0.0025% owned by Petrokimia Gresik Foundation. PT Petrokimia Gresik is widely known nationwide as the largest fertilizer manufacturers in Indonesia with installed total annual production capacity of 6.17 million tons. 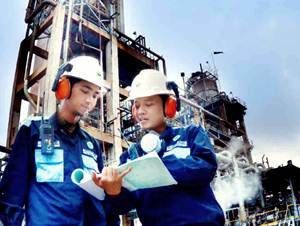 Petrokimia Gresik already owns 23 production plants (16 fertilizer plants and 7 non fertilizer plants). Petrokimia Gresik's office networks supported by 9 distribution centers, 240 buffer warehouses, 609 distributors, and 24,580 Official Retail Outlets throughout Indonesia. Petrokimia Gresik also supported by 2 subsidiary companies, 1 joint venture company, 8 associated companies. In terms of financial performance, PT Petrokimia Gresik reported an increase of 6.47% in total sales from Rp 25,103.37 billion in 2014 to Rp 26,729.49 billion in 2015. Profit for the year 2015 amounted to Rp 1,550.98 billion. This total profit figures represented a decrease of 12.36% over profit for the year 2014 of Rp 1,769.73 billion, according to Petrokimia Gresik Annual Report 2015 as cited by JobsCDC.com. D3 majoring in Instrumentation Engineering. D3 majoring in Mechanical Engineering. D3 majoring in Chemical Engineering. D3 majoring in Chemical Analysis. D3 majoring in Physics Engineering. D3 majoring in Electro Engineering. D3 majoring in K3 Engineering / Hyperkes & KK. D3 majoring in Informatics Engineering. D3 majoring in Industrial Engineering. D3 majoring in Soil Science. D3 majoring in Plant Breeding. D3 majoring in Plant Pests & Diseases. D3 majoring in Social Economics of Agriculture. D3 majoring in Agricultural Microbiology. D3 majoring in Seed Industrial Technology. D3 majoring in Civil Engineering. D3 majoring in Naval Architecture. Have graduated D3 as evidenced by a diploma or Certificate of Graduation (SKL) with minimum GPA of 3.00. Graduates of the University / Polytechnic with minimal Accreditation B. Maximum age of 25 years old (born after 1 November 1991). Minimum TOEFL PBT score of 400/minimum TOEFL IBT score of 32/minimum IELTS score of 4.5/minimum TOEIC score of 500. JobsCDC.com now available on android device. Download now on Google Play here. Please be aware of recruitment fraud. The entire stage of this selection process is free of charge. PT Petrokimia Gresik - D3 Fresh Graduate Program PIHC Group November 2016 will never ask for fees or upfront payments for any purposes during the recruitment process such as transportation and accommodation.